Smarter spend management is lacking in most organizations, largely due to the tools being used to manage their procurement processes. Oracle Procurement Cloud combines cloud, best-of-breed functionality, and native connectivity. 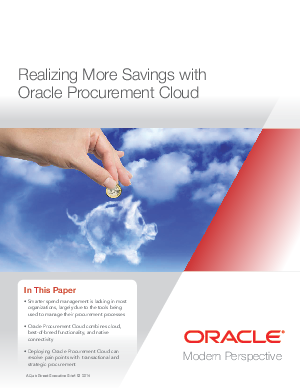 Deploying Oracle Procurement Cloud can resolve pain points with transactional and strategic procurement.